DaveJ had the most liked content! Traditional Japanese metal working and craftsmanship, found, reclaimed, and natural materials, tanto. fairly old low alloy carriage spring...traditional clay and water quench using a charcoal forge...~1mm thick layer of roughly 1:1:1 natural clay, charcoal powder, and polishing stone powder...blade is about 29cm long (nagasa), 2.3cm wide (motohaba) and 6mm thick (motokasane)...close up of the rough kajitogi polish done with very coarse waterstones (torajirushi 80#, lobstercarbon 120#) to check the hamon placement... watch it happen below (more info here: http://islandblacksmith.ca/process/)... yoroshiku! 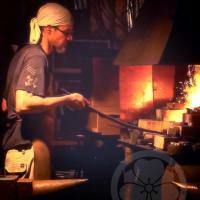 Some of the best footage of a Japanese swordsmith I have ever seen. here is a (slowly) ongoing series with some info on the classical approach: http://islandblacksmith.ca/tag/tanto-geometry/ in particular the tang/machi geometry: http://islandblacksmith.ca/2014/06/classical-tanto-geometry-nakago-tang/ and the habaki 's machigane: http://islandblacksmith.ca/2014/10/classical-tanto-construction-habaki-の-machigane/ i always recommend studying antiques and making kata to get a feel for the finer points of tanto geometry: http://islandblacksmith.ca/2014/04/aizu-shintogo-kunimitsu-tanto-kata/ from here it looks like there is still plenty of room inside your hardened area to create a classical tanto kissaki/tip if you decide to: http://islandblacksmith.ca/2014/06/classical-tanto-geometry-blade-kissaki-tip/ that is a lovely piece of cedar but might be a bit soft for tanto, nootka cypress/alaskan yellow "cedar" is a bit closer to the hardness and workability of hounoki... keep up the journey towards excellence! Something different from me... not really. But I like it. @peter, i have seen similar methods of soldering used by traditional copper vessel makers in japan... thanks, @peter!